My family takes Cookie Making Day seriously and it sits high on our priority list. Crazy measures are always taken to make sure it is a success. My favorite year was when an extra oven was brought and hooked up in the dining room because having only one oven was slowing us down. 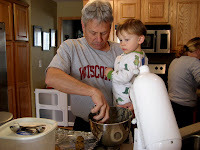 When we moved to Wisconsin, Cookie Day moved with us. Three years in a row, everyone made the trip up to bake (and to successfully freeze their asses off.) We made a weekend out of it and always planned activities to keep it interesting. 2009 Cookie Making Day is up next. I know, I know, The Excitement!, The Excitement!